Imagine finding out your loved one is diagnosed with hepatocellular carcinoma (HCC), and the only source available to learn about this disease is from a medical textbook. Andrea J. Wilson and her sister, Adrienne Wilson, experienced just that. On May 16, 2001, Adrienne – who Andrea raised from the age of 8 years old – came home from high school experiencing intense pain under her right ribs. 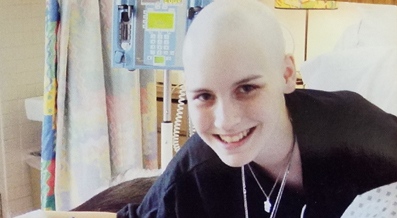 Following a visit to the emergency room, physicians discovered tumors in Adrienne’s liver and lungs, a diagnosis which she passed away from just 147 days later at the age of 15. One year after her sister’s passing, Andrea tried to alleviate her grief by volunteering, in particular, by raising awareness and educating people on liver cancer. However, after reaching out to a larger nonprofit, she learned that no advocacy groups focused their attention specifically to this area. So, Andrea, as well as friends and family of Adrienne, started Blue Faery. After Adrienne was diagnosed, Andrea received one page’s worth of information on the different chemotherapy drugs to treat HCC. However, when she queried for more information, she was informed there really wasn’t anything. So, the physician who did Adrienne’s biopsy made Andrea copies of his medical textbook for her to reference. Therefore, Blue Faery started with the education portion of its mission first. The organization created the first ever HCC patient education brochure. The brochure, specifically written in laymen’s terms, is free for patients, their caregivers, as well as health care providers on BlueFaery.org. It has found its way in to more than 40 cancer centers, and is available in multiple languages. “We just want patients to have the information and know the types of questions they should be asking their doctors,” Andrea said. Another initiative to further research in HCC is the organization’s Blue Faery Award for Excellence in Liver Cancer Research – an annual award that honors a researcher who has made significant contributions in the advancement of scientific knowledge in the diagnosis, treatment, prevention or understanding of liver cancer. To honor Adrienne, the award is announced every year on her birthday, April 8. Launched this year, Andrea also highlighted her 40-episode podcast derived from the book she wrote about Adrienne’s journey with HCC – titled “Better Off Bald” – from a diary-kept perspective. The podcast was launched on May 15 of this year to reflect the actual timeline of Adrienne’s story. The first podcast was based around the day before Adrienne’s diagnosis, and continued on through her treatment, ending on Oct. 17. Next up, Blue Faery plans to launch patient forums, which currently does not exist for patients with HCC. After receiving a Google ad grant, the organization is currently working to market the forum and get the word out. “We are really stressing it is not the place to go for medical advice. But it is a good place to go where you can go and talk to someone else who has the same diagnosis as you,” Andrea added.